Want to kick your home theater up a notch? Denon's 7.2-channel AVR-X3500H lets you watch 4K video sources on up to three compatible displays — and it even upscales analog and HDMI sources so you can enjoy more of your video content in stunning Ultra High Definition. Dolby Atmos and DTS:X bring movie soundtracks to life with immersive, three-dimensional surround sound effects. The 'X3500H's built-in Wi-Fi and Bluetooth let you stream music from different sources. A phono input provides a convenient connection for a turntable. 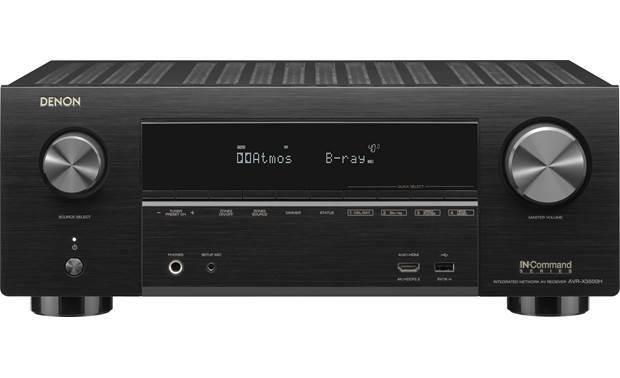 This powerful receiver even offers convenient playback of several different high-resolution audio formats through the front-panel USB port or a computer connected to your home network. Built-in HEOS technology lets you access all your music — from your personal library, internet radio, and popular streaming services like Pandora®, Spotify®, and TIDAL — through the 'X3500H. The HEOS Home Entertainment skill for Amazon Alexa lets you use your Echo or Echo Dot to issue voice commands to the AVR-X3500H. You can easily switch inputs and control volume and playback on the receiver and other HEOS enabled devices. Alexa can also help you search for music and stream different content to different rooms in your multi-room HEOS system. The 'X2500H has outputs for seven speakers, with assignable rear surround channels. If you aren't looking to set up a full 7.2 surround system, you can use these connections to power a pair of speakers outdoors or in another room and still enjoy 5.2-channel sound in your living room. You could also set up an immersive 5.1.2 Atmos system by adding a pair of Atmos enabled speakers, or bi-amp your front speakers for more powerful sound. Excellent product. Well described by Cruchfield. Discrete Amplification: The Denon AVR-X3500H AV receiver features a powerful Class AB power amplifier section equipped with discrete high current power transistors. This discrete amplifier design delivers optimum realism and stunning dynamic range. By using high current, high power discrete power devices, the amplifier is able to easily drive high quality speakers. 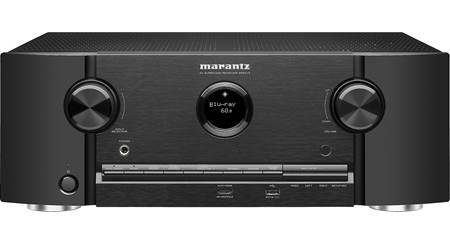 The AV receiver's seven channel Class AB amplifier is rated at 105-watts (into 8Ω, at 20-20kHz, with 0.08% THD, driving 2 channels). Amplifier Assignment: The AVR-X3500H's seven discrete amplifier channels can be configured to accommodate your type of home theater setup. 5.1ch + Zone 2: The AVR-X3500H's amplifier channels can be configured for 5.1ch playback in the Main Zone for Dolby Digital & DTS 5.1ch movie soundtracks and 2ch playback in Zone 2. In this configuration there are no Front Height, Surround Back, or Dolby Atmos speakers. 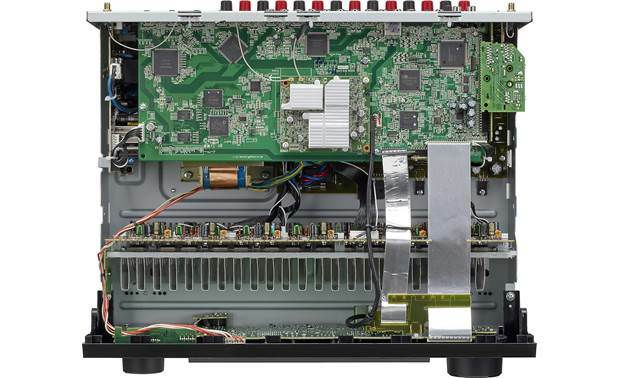 Reference Class 32-Bit AKM DACs: For optimum fidelity and the widest dynamic range with lowest distortion, the Denon AVR-X3500H features advanced reference-class 32-bit AKM AK4490EQD/A converters on all channels. Enjoy consistent high-fidelity and precise channel matching across all channels for the ultimate listening experience. Quad-Core DSP: The AVR-X3500H includes an advanced DSP (Digital Sound Processor) chip for tremendous power processing for movie and music soundtracks. With four 300MHz DSP cores that are capable of processing over one billion computations per second, the AVR-X3500H supports the latest surround sound processing formats - including Dolby Atmos & DTS:X.
Immersive Surround Sound: The Denon AVR-X3500H AV receiver goes beyond regular surround with the latest immersive surround sound formats, including Dolby Atmos and DTS:X.
Dolby Atmos: Dolby Atmos surround sound technology dispenses with channel-based coding in favor of more advanced object-based coding, giving the soundtrack designer the ability to precisely place sounds anywhere in the 3-dimensional space. Now you can enjoy this same award-winning technology at home with the AVR-X3500H that lets you connect a 5.1 surround sound speaker system and 2 additional overhead speakers or 2 Dolby Atmos elevation speakers for the ultimate home theater experience. DTS:X: The latest immersive surround sound system, DTS:X features object-based audio coding that lets the soundtrack designer place sonic elements anywhere in the 3D acoustic soundspace, and provides for overhead speakers to deliver a stunning surround sound experience. Along with DTS:X decoding, the AVR-X3500H features DTS-HD Master Audio decoding and other DTS audio technologies. Listening Modes: The Denon AVR-X3500H features a variety of Listening modes to choose from, so you can enjoy your movie or music soundtrack the want you want to hear it. Direct Modes: The Denon AVR-X3500H offers two Direct Listening Modes which bypass the receiver's tone & DSP processing for higher sound quality performance. Direct Mode provides playback of 2ch or Multichannel audio in its original form, without any surround or tone processing. Pure Direct Mode goes a step further by turning off the receiver's display and analog video circuitry to minimize the possibility of any noise being added to the audio signal. Audyssey Suite: The AVR-X3500H features the Audyssey suite of powerful DSP features - including MultEQ XT32, Sub EQ HT, LFC (Low Frequency Containment), Dynamic Volume, and Dynamic EQ. Audio Enhancements: The Denon AVR-X3500H receiver provides various audio enhancements to deliver a high-quality listening experience every time. Volume & Level Settings: The AVR-X3500H offers the following volume & level settings. Audio Outputs: The Denon AVR-X3500H AV receiver features spring-clip speaker terminals, 7.2ch pre-outs, and a front-panel headphone jack. Color-Coded Speaker Terminals: The receiver has binding-post terminals for all speaker connections. The binding-post terminals can accept bare wire, pin connectors, and banana plugs (single/dual). The receiver will accept speaker impedances of 4 to 16-ohm. The AV receiver comes with color-coded labels to easily identify which channel a speaker cable should be connected to. 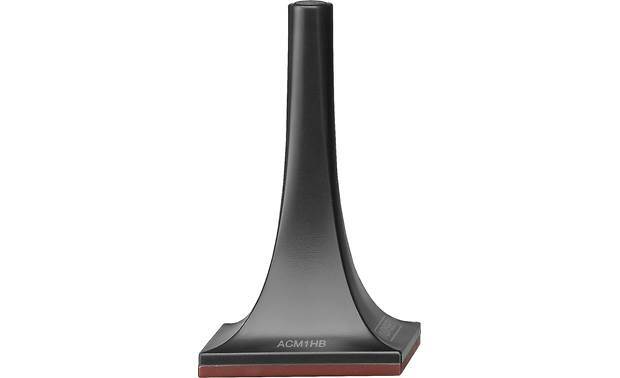 Since the speaker cables have labels in the same colors as the connectors on the AVR-X3500H's rear panel, there's no longer any confusion about which terminals they should be connected to. 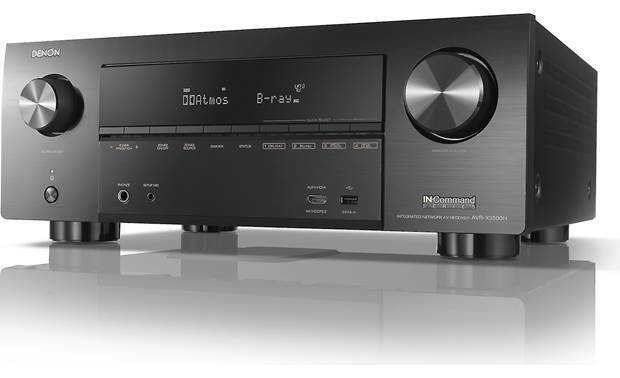 7.2Ch Pre-Outs: The AV receiver features 7.2ch pre-amp outputs (Front L/R, Center, Surround L/R, Surround Back L/R, and Dual Subs) for connection to external power amplifiers. The pre-outs are variable. 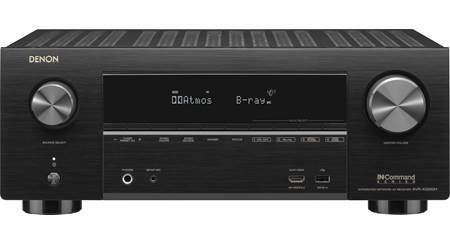 For compatibility with dual subwoofer home theater systems, the AVR-X3500H features two discrete subwoofer outputs. With dual subwoofers, which can be placed in different parts of the room, you'll benefit from response averaging, which helps provide smoother and more detailed deep bass, compared to a conventional single subwoofer speaker system. 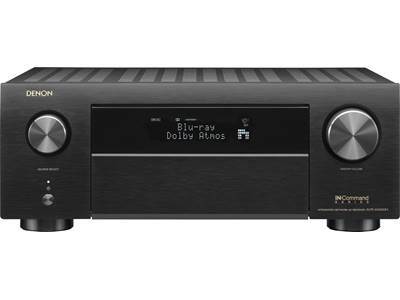 Phono Input: The Denon AVR-X3500H is outfitted with a Phono input (MM), so you can connect your turntable and listen to your vinyl records with high-quality sound. HDMI 2.0b: Featuring eight HDMI inputs (7 rear/1 front) and three HDMI outputs, the AVR-X3500H incorporates an advanced video section that features the latest HDMI 2.0b specification, including support for 4K/60 Hz Ultra-HD video, BT.2020 Wide Color Gamut, High Dynamic Range (HDR), 4:4:4 Pure Color sub-sampling and 21:9 video pass-through, along with support for 3D content. The AVR-X3500H also features HDCP 2.2 compatibility, a requirement for 4K Ultra HD copy-protected content. 4K/60Hz + HDCP 2.2: The AVR-X3500H's HDMI inputs and monitor outputs support up to 4K (3840x2160 pixels) video @ 60 frames per second. All of the HDMI jacks support HDCP 2.2, which fully complies with the latest copyright protection standard for 4K video transmission. The receiver will also pass a 480i, 480p, 720p, 1080i, or 1080p video signals via HDMI. HDR (High Dynamic Range): The Denon AVR-X3500H supports HDR (high dynamic range) Video - including HDR 10, Dolby Vision, and Hybrid Log-Gamma. HDR provides enhanced picture quality by simultaneously enabling greater detail for both the dark and bright parts of an image. HDR reproduces a greater dynamic range of luminosity or brightness levels, creating greater contrast. This increased contrast reveals the subtle nuances of the image, from detailed blacks and shadows to the brightest whites and colors, plus greater depth. 4K Video Upconversion & Upscaling: The Denon AV receiver's sophisticated video processor provides upconversion from standard definition (480i/480p) and high definition (720p/1080i/1080p) sources to 4K Ultra HD (3840x2160 pixels), which lets you connect all your analog (composite/component) or digital (HDMI) video sources to the AVR-X3500H and then connect to your TV with just a single HDMI cable. Only the receiver's main HDMI output supports video upconversion. Other HDMI Features: The Denon AVR-X3500H AV receiver's HDMI connectivity also offers 3D video pass-through, Deep Color & x.v.Color support, as well as an auto LipSync function. 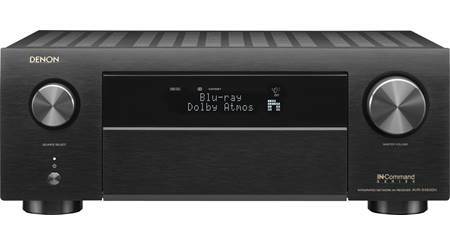 3D Ready: The AVR-X3500H AV receiver supports 3D video pass-through (720p/1080p only) from connected 3D-compatible Blu-ray, games and broadcast devices to 3D-compatible HDTVs (all 3D components must be connected via HDMI). Special eyewear will be required for viewing 3D content. Analog Video: The receiver features three composite video inputs, two component video inputs, and one component video output. The composite video inputs are output to your television via the receiver's HDMI monitor output (there is no composite video output). The component video inputs can be output to your TV via the receiver's component monitor output or via the main HDMI monitor output. Both the composite and component video jacks only support up to 480i (not compatible with 480p, 720p, or 1080i/p). Advanced ISFccc Video Calibration: The AVR-X3500H is certified by the Imaging Science Foundation to deliver top video quality, and the unit also features advanced ISFccc video calibration controls that allow for precision fine-tuning of the connected HDTV, even if it's not an ISF certified set. You can choose from a variety of Picture Modes - Standard, Movie, Vivid, Streaming, ISF Day, ISF Night, Custom, or Off. The Custom mode lets you manually adjust Contrast, Brightness, Saturation, Noise Reduction, and Enhancer (sharpness). Wired or Wireless Network Connection: The Denon AVR-X3500H offers a wired or wireless network connection. Either network connection gives the receiver access to HEOS music apps (like Pandora, Amazon, or Tidal), TuneIn Internet Radio, Spotify Connect, your music library on your Apple iOS or Android device, as well as music content on your Windows PC or DLNA music server. Ethernet Jack: The Denon AVR-X3500H receiver is fitted with a RJ-45 Ethernet (LAN) port to make a wired connection from the receiver to your home network. TuneIn Internet Radio: The Denon AVR-X3500H includes access to more than 100,000 free internet radio streams from all corners of the globe via the built-in TuneIn online music service. Simply select TuneIn from the receiver's on-screen menu using the included remote and browse among the 100,000 stations neatly organized into popular categories and select a station that appeals to you. DLNA 1.5 Certified: The AVR-X3500H is DLNA (Digital Living Network Alliance) 1.5 and Windows 7/8/10 compliant for audio networking. This means it's easier for you to access and enjoy digital music stored on your Windows PC. The receiver can wirelessly playback High-Res music content from your PC, while using the included remote control to browse your music library. The receiver supports ID3-Tag (ver.2) and META tag information; so song title, artist name, and album name can be displayed on the unit's front-panel or on-screen menu. In addition the unit will display Album Art on a connected television. 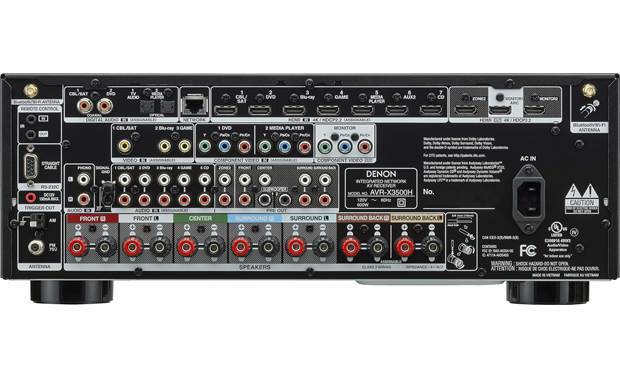 The Denon AVR-X3500H supports the following audio formats, sampling frequencies, and bit rates via its wired network connection. Built-in Bluetooth: The Denon AVR-X3500H features built-in Bluetooth (version 3.0+EDR) with a 98.4' wireless range for music streaming (A2DP 1.2) and control (AVRCP 1.5). You'll be able to wirelessly connect to smartphones (including iPhone & Android), tablets (including iPad & Android), laptops (including Microsoft Surface & Macbook), computers (including Windows PC & Mac), and other Bluetooth-enabled devices. Up to eight Bluetooth devices can be remembered by the AVR-X3500H, so family members as well as friends can enjoy their favorite tracks (only one device can be used at a time). HDMI Zone 2: The AVR-X3500H also incorporates multi-zone HDMI audio/video distribution for Zone 2 with the inclusion of its HDMI matrix switching functionality. The receiver can send two different HDMI video feeds to two displays at the same time directly from the receiver. HDMI Zone 2 also supports 2ch PCM audio from the HDMI input source selected. The HDMI Zone 2 function is only compatible with the HDMI 1-7 input connectors. It is not compatible with the HDMI 8 input connector or any other input source. Volume of HDMI Zone 2 is controlled from the TV or additional receiver in Zone 2. Zone 2 (Speaker-Level & Line-Level Output): Zone 2 allows stereo audio playback of another source connected to the receiver in another room of your home via RCA line-level output or speaker-level output. When using the AVR-X3500H to power speakers in a second room of your home, the main zone is restricted to 5.1-channels. When using the receiver's line output terminals for the second room you need an additional amplifier to power your Zone 2 speakers; the main Zone of the receiver remains 7.1-channel. The volume of Zone 2 can be controlled by the Denon receiver using either configuration or from your add-on amplifier when using the line-output. HEOS Wireless Multiroom Audio: Built-in HEOS technology enables the AVR-X3500H to become part of the HEOS by Denon wireless multi-room audio eco-system, allowing you to stream and control all of your local and online music effortlessly from anywhere in your home with the HEOS App on your compatible Apple iOS or Android mobile device over a wireless WiFi network connection. The HEOS system is a true multi-room audio system that automatically synchronizes audio playback between multiple HEOS devices so that your music (up to 24-bit/192kHz Hi-Res audio) coming from different rooms is perfectly in sync and always sounds amazing. You can play the same audio source (other than your connected TV) in every room or any combination of rooms you choose, including a different song in every room. HEOS App: You'll need to download the HEOS App (for Apple iOS 8.0+ and Android OS 4.0) onto your compatible Apple iOS or Android mobile device to enjoy HEOS functionality through the AVR-X3500H receiver. Using your compatible mobile device and the HEOS app, you can setup, browse, explore, and control HEOS system right in the palm of your hand, from anywhere in your home. Your compatible Apple iOS or Android device must be connected to the same home wireless (WiFi) network as the AV receiver and your entire HEOS system. The HEOS app consists of 4 control screens. 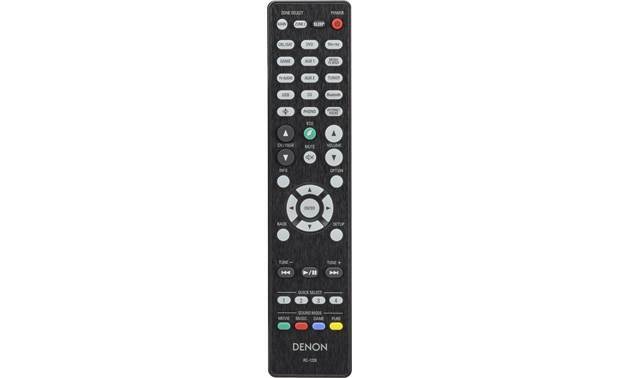 IR Remote: The Denon AVR-X3500H comes with an IR remote for wireless operation of the AV receiver. It also supports HDMI-CEC and Smart TV Control. Smart TV Control: You can even control the Denon AVR-X3500H with your Smart TV remote via an HDMI connection and the HDMI CEC functionality associated with your Smart TV. Simply set "HDMI Control" to ON in the receiver, then set "Smart Menu" to ON and begin controlling the AVR-X3500H with your TV's remote. The Smart Menu home screen provides you quick access to source and surround mode selections, the AVR's setup menu and four Smart Selects (or "Quick Selects"). Custom Integration: The AVR-X3500H is part of Denon's IN-Command series line-up of receiver, which is Denon's certification to custom installers that the receiver has advanced connectivity and control features often required for custom home integration and theater applications using premium control systems. These features include IP control, a RS232C jack for use with whole house control systems, remote in/out IR command control, and a 12V trigger output. 12V Trigger Output: The AVR-X3500H has a single minijack output to send a 12-Volt DC turn-on signal to another component that accepts a 12V trigger, such as a power amplifier in Zone 2. The conditions under which the trigger output activates is programmable. Remote Monitoring: In today's custom install environment, it's critical for integrators to provide quick, reliable assistance and service to their clients, even after the install is complete. To support this effort, the Denon AVR-X3500H AV receiver features "ihiji Invision" and "Domotz Pro" remote system monitoring and management technology. These programs allow custom integrators to monitor the status of connected products and troubleshoot remotely from the office or on the go, reducing the time it takes to address the issue. Crestron Connect Intelligence: By embedding Crestron Connect intelligence in the Denon AVR-X3500H, it allows for seamless communication with Crestron home automation solutions, giving installers a simplified home theater solution and homeowners complete control of their home entertainment system. Advanced OSD w/ Setup Assistant (via HDMI): Once you connect your TV to the AVR-X3500H via HDMI, the exclusive Denon Setup Assistant appears on your TV screen to walk you through setup, step-by-step. With Denon's advanced on-screen menu and setup assistant, you can connect, configure, and use your home theater system with ease. The OSD and setup assistant features clear on-screen graphics and text that optimizes critical system settings for your particular home theater setup. Quick Select: On the AVR-X3500H's front-panel and remote, you'll find four Quick Select buttons that let you quickly choose from the most popular input sources. With Quick Select, the AVR-X3500H remembers not only your preferred inputs but also your preferred audio settings, so you can enjoy precisely tailored sound with each one. My two main front channel speakers are Audio Physic Avantis, 4 ohm speakers. What is power rating at 4 ohm? Also, OK to mix center and rear speakers (if not wireless) with 8 ohm ratings? My current amp (NAD M3) has no problem with 4 ohm loads: should I keep it to drive the main channels? The AVR-X3500H is stable down to 4 Ohms on each channel. You can certainly mix 4 Ohm speakers with 8 Ohm models on other channels without issue. While each channel is stable down to 4 Ohms, Denon does not publish a full bandwidth (20-20,000Hz) wattage rating at this impedance. Searches related to the Denon AVR-X3500H 7.2-channel home theater receiver with Wi-Fi®, Apple® AirPlay® 2, and Amazon Alexa compatibility.